Dane van Niekerk of South Africa and Salma Khatun of Bangladesh pictured during the coin toss ahead of the ICC Women's World T20 2018 match between South Africa and Bangladesh at Darren Sammy Cricket Ground on November 18, 2018. 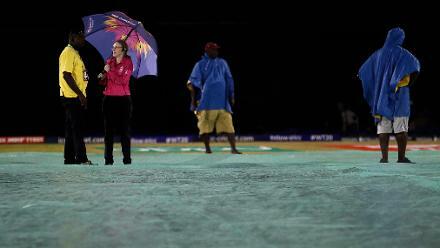 Groundsman Kent Crafton and reserve umpire Kim Cotton look on, as rain delays the start of the ICC Women's World T20 2018 match between South Africa and Bangladesh at Darren Sammy Cricket Ground on November 18, 2018 in Gros Islet, Saint Lucia. 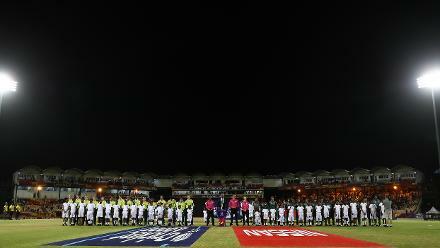 South Africa line up against Bangladesh during the ICC Women's World T20 2018 match between South Africa and Bangladesh at Darren Sammy Cricket Ground on November 18, 2018 in Gros Islet, Saint Lucia. 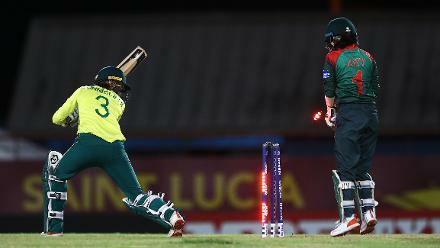 Lizelle Lee of South Africa sweeps the ball towards the bounadry, as Nigar Sultana of Bangladesh looks on during the ICC Women's World T20 2018 match between South Africa and Bangladesh at Darren Sammy Cricket Ground on November 18, 2018. 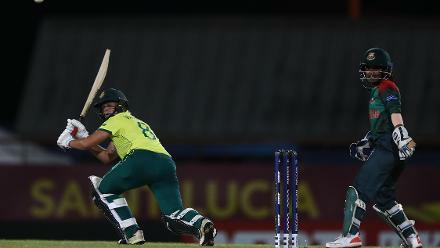 Bangladesh celerate the wicket of Lizelle Lee of South Africa, after she was run out during the ICC Women's World T20 2018 match between South Africa and Bangladesh at Darren Sammy Cricket Ground on November 18, 2018 in Gros Islet, Saint Lucia. Sharmin Akhter of Bangladesh is bolwed by Sune Luus of South Africa during the ICC Women's World T20 2018 match between South Africa and Bangladesh at Darren Sammy Cricket Ground on November 18, 2018 in Gros Islet, Saint Lucia. 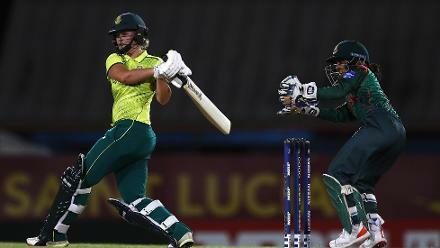 Dane van Niekerk of South Africa hots the ball towards the boundary, as Nigar Sultana of Bangladesh looks on during the ICC Women's World T20 2018 match between South Africa and Bangladesh at Darren Sammy Cricket Ground on November 18, 2018. 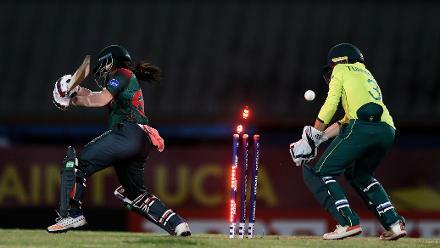 Faye Tunnicliffe of South Africa is bowled by Salma Khatun of Bangladesh during the ICC Women's World T20 2018 match between South Africa and Bangladesh at Darren Sammy Cricket Ground on November 18, 2018 in Gros Islet, Saint Lucia. 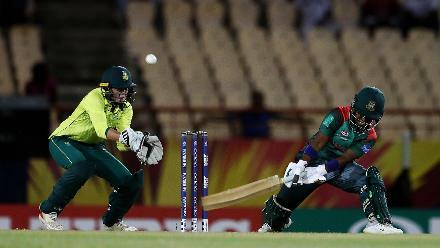 Rumana Ahmed of Bangladesh plays a reverse sweep, as Faye Tunnicliffe of South Africa looks on during the ICC Women's World T20 2018 match between South Africa and Bangladesh at Darren Sammy Cricket Ground on November 18, 2018. 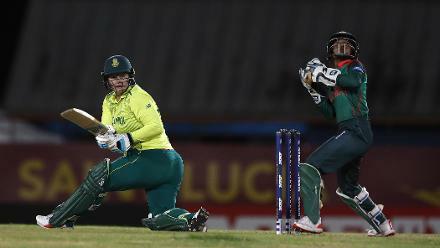 Dane van Niekerk of South Africa hits the ball towards the boundary, as Nigar Sultana of Bangladesh looks on during the ICC Women's World T20 2018 match between South Africa and Bangladesh at Darren Sammy Cricket Ground on November 18, 2018.